this month of painting little elephants has been great for me! I've enjoyed working on each one, even if the painting didn't go as planned. there was no fear of them not being 'good enough'. there were moments of doubt that I could do what I envisioned the painting looking like but I painted on and didn't worry about ruining it. thats the great thing about little canvasses; it means hardly any waste of paint. the layers only add to the texture, and if you know me and my art, you know I love texture! there is more depth of color than what the phone camera will pick up. I figure in actual painting time each canvas has taken between 1 and 2 hours to do, with more time in the beginning for finding a reference photo, thinking and sketching, so a rough total of about 3 hours for each painting. this batch will be $15 at this size (including a teeny little easel for showcasing the art). this is the price I charge for my teeny-tiny 2"x2" minis. these are a bit bigger, but when we received this batch of canvasses in the mail we found out that inexpensive tiny canvasses may or may not be square and the same size as each other. in other words, this batch of canvasses are not up to my standards as an artist, even if the actual paintings are. so, you get a discount on each of these beauties! hopefully the next batch we buy (from a trusted source) will be a much better quality. for me it will be worth the expense to have square canvasses! when these elephant paintings are complete and scanned to be put in the store for prints, I will be adding a layer of protective varnish to keep the dust from getting into the paint layers. then they will be ready to go to their new homes. I will be posting when they are ready. 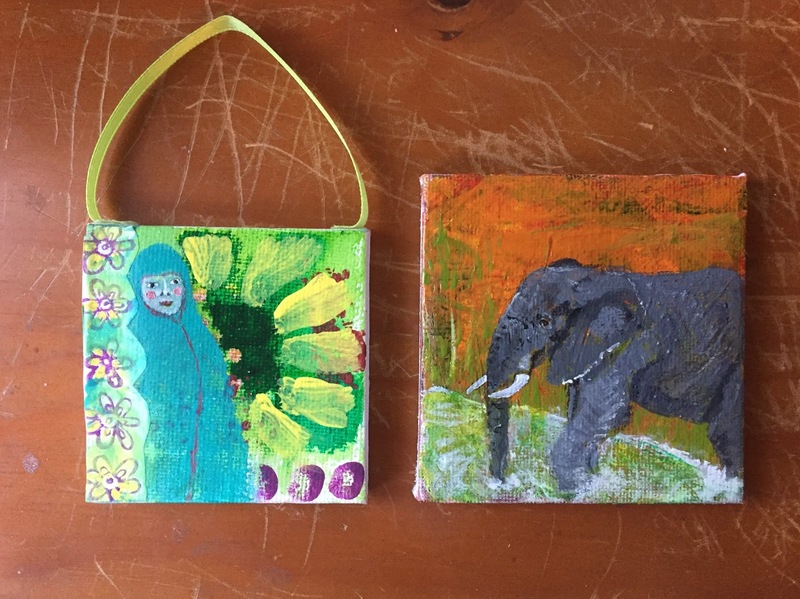 a 2x2 inch painting compared to the 3"x3"
I've liked doing these small paintings so much that I will continue working on the smaller ones. not daily. maybe not this small, cause, come on! that was a little crazy trying to get detail on a tiny elephants eye or the creases in the skin. I was going cross eyed at times! but maybe 4x4s or 5x5s. and probably not elephants for a little while, cause I think I may be tapped out. for now. 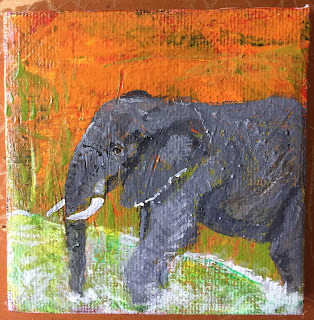 they are wonderful creatures and I adore their body movement and capturing that and their glorious soul in my artwork has been pretty cool, so I may have an elephant here and there in the future. the goal is to find another subject I can get lost in for a little while! any suggestions? 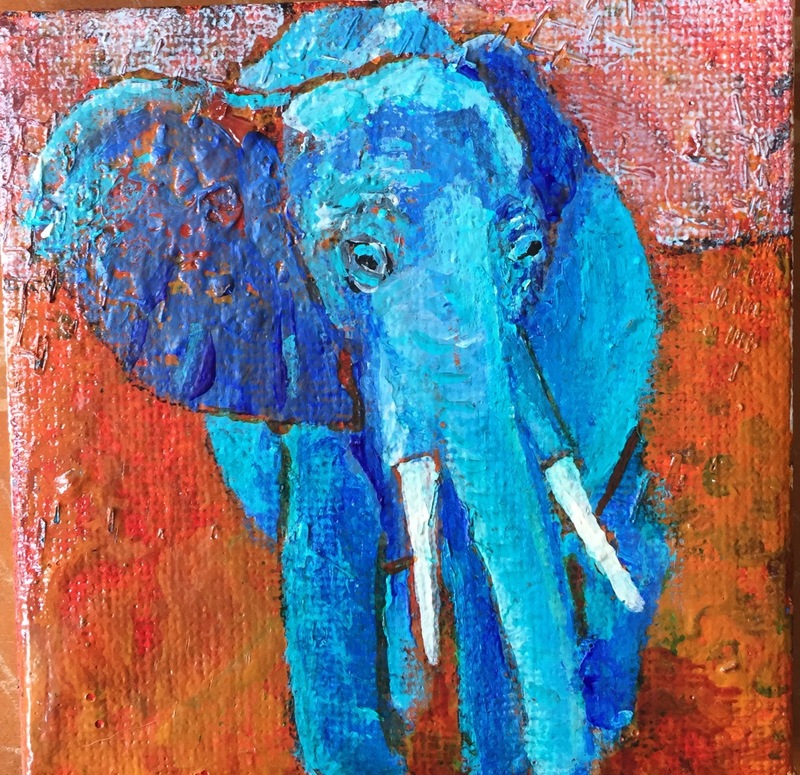 I do enjoy painting animal totems, so there are a plethora to choose from! maybe some ravens next. or some alpaca paintings.